14k gold-filled earrings with rainbow moonstone on French earwires. Approximately 1.5″drop. These are your new every day earrings. Handcrafted on a US barrier island. The ELEUTHERA EARRINGS WITH RAINBOW MOONSTONE AND 14K GOLD-FILLED METAL is definitely the most fashionable earrings out there. They are filled with 14 karat gold sitting a big rainbow moonstone on French ear wires. The length is an approximate 1.5 inches drop and they have been handcrafted on a US barrier island to meet your everyday fashion needs. They are strong and long lasting with a mighty effect on whatever clothes that you choose to pair them with. The ELEUTHERA EARRINGS WITH RAINBOW MOONSTONE AND 14K GOLD-FILLED METAL will boost your fashion moral, upping your fashion game while ensuring that you take the lead in attracting attention to your outfit. They are specially made for the everyday beautiful lady and if you are a man that loves your lady to always be on her best, then the ELEUTHERA EARRINGS WITH RAINBOW MOONSTONE AND 14K GOLD-FILLED METAL is the perfect gift item for her. 14k gold fresh earwires: The are gold and are very strong. The ELEUTHERA EARRINGS WITH RAINBOW MOONSTONE AND 14K GOLD-FILLED METAL are made with French ear wires which are guaranteed to be as strong as ever and the 14k gold will definitely place you way above the competition and on a higher realm. 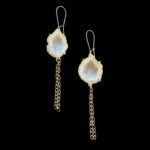 Rainbow Moonstone: The ELEUTHERA EARRINGS WITH RAINBOW MOONSTONE AND 14K GOLD-FILLED METAL features a rainbow moonstone dropping down the 14 karat gold string with an amazing striking effect. Lightweight: They are light and won’t ever leave bigger holes on your ears. As a matter of fact, you won’t even know they are there or feel them except for when someone compliments you on how beautiful they are. 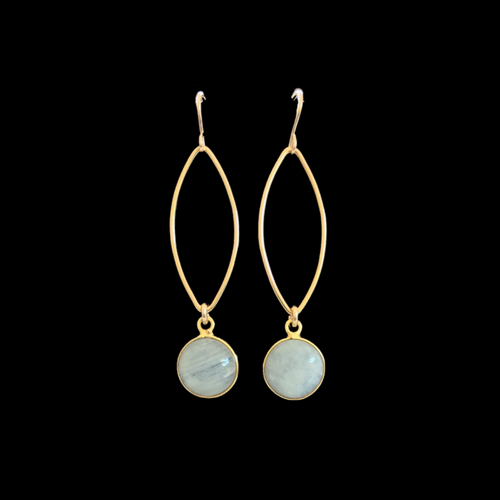 Strong and durable: The ELEUTHERA EARRINGS WITH RAINBOW MOONSTONE AND 14K GOLD-FILLED METAL are handcrafted on a US barrier island with durability in mind. They will be lasting you for a long time.